Today Ailbhe was feeling very fresh on the lunge and each transition was accompanied by a squeal of glee from himself. In the end I just unclipped the lunge line and let him have some fun. Here's the result. 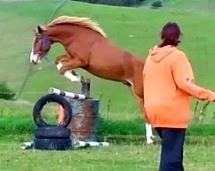 Note, no jumping lane or feed in poles, just the jump which he jumped, from both directions, for fun. No running out, no stopping and minimal encouragement required from me. 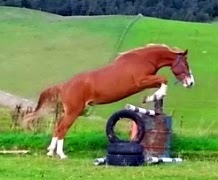 Took the top pole once when he was getting tired but was finding his own stride and thinking he was really very clever, hehe! 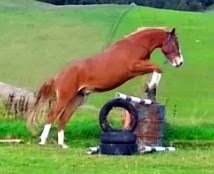 He may not be a GP prospect but he's super enthusiastic and always tries his absolute best. He's a good boy!